Has Ethereum Bottomed While Stocks Are in a Bubble? Ethereum has suddenly risen today on increased volumes to above $200 at the time of writing. 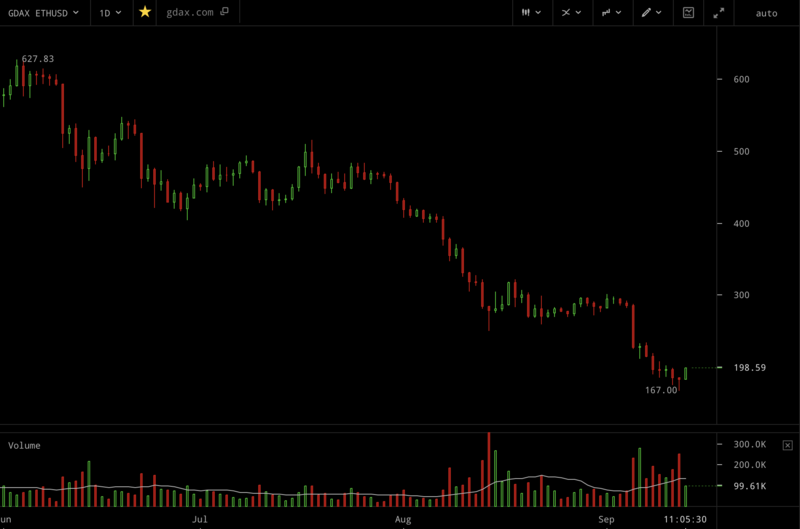 That’s after reaching a new low of $167 yesterday. A low that was tested in quick succession about three times and perhaps even a fourth time, with it holding as there may have been no more sellers left or perhaps there were far more buyers to cover them all and more. 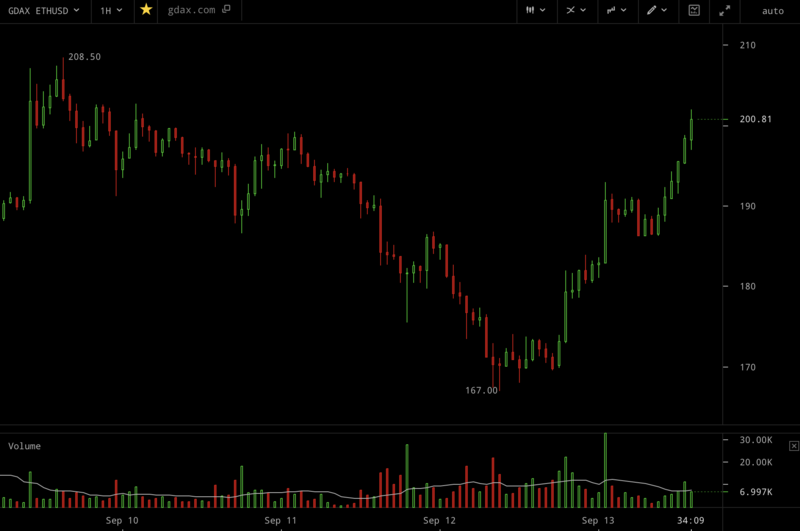 Now most seem to think, after a nine month drop of 87%, that this has bottomed. Perhaps, only time will tell whether it has or otherwise. Ethereum’s price on daily candles, Sep 2018. Pretty much straight down for all summer until the one cross yesterday when even bears may have been scared of $167. Coincidentally, 167 is almost precisely half of 324. If you’ve just come here from the stock market, the relevance of that is considerable because 324 is a huge meme. So our discovery that 167 is half of it means illuminatus is finally confirmed. 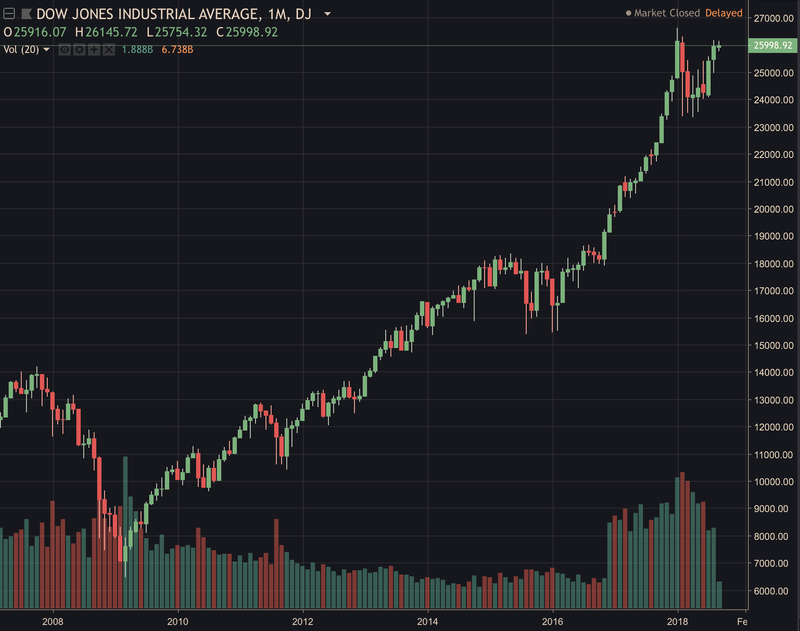 Dow Jones on monthly candles, September 2018. Straight up for about ten years, fueled perhaps by endless Fed money printing and maybe overall bullish sentiment to increase some 4x with the lowest price here being some 80% from the current high of $26,000. Cryptos have dropped 80%, so is that just a coincidence or them laluminatus again? And, as much as we’d rather not for we enjoy booming times, is it not perhaps wise to ask just how high this can now go? In other words, would it not make some sense to diversify at the very least perhaps just 1%? If all stock owners did do so, then the global stocks market cap is estimated at $100 trillion, which would give eth a market cap of $1 trillion, same as Amazon or Apple. Eth is of course far more global in nature than Amazon or Apple and quite a bit easier to access as crypto exchanges have sprung up across the globe yet currently its ability to transfer $billions of value across the world, among many other abilities, is valued at just $20 billion. It was at $150 billion this January, with nothing changing since then except of course growing infrastructure, awareness and interest in its capabilities. It further has plans to significantly grow its capacity, allowing it to handle certainly more transactions per second than PayPal, and in the medium term potentially more than Visa. To say nothing of the “dividend” like returns from staking when that goes out at about 5% to 8% of the eth capital a year. And if we were to go into all the other use cases in industry, in entertainment, in finance of course, potentially even in governance as far as identity, record keeping, authentication, in shipping, in autonomous cars, and in far much more to mention, then we’d have to write a book rather than an article. How ethereum changed the world, would be a suitable title for it if or once the time is right and we are old enough to spend it in such luxuries as writing books. For now, suffices to say that as far as calculated bets go, swapping an asset that might be at the top for one that might be at the bottom might make sense. Of course it might not, no one knows the future, but then that’s why we called it a calculated bet. Diversifying 10% of what might be a risky asset as it might be at the top for another risky asset which might be at the bottom may have a positive Expected Value (EV). Plus, the added benefit of eth is that even if it goes to absolutely zero dollars, one eth remains one eth which can be sent around the world without requiring any permission and without anyone being able to interfere with that one eth to make it 1.01 eth or 0.99eth. It doesn’t change in anyway, it remains instead the same mathematical creation of science and ingenuity at zero dollars just as $20,000. That in itself makes it a completely new asset class without any correlation to any other asset, so making it suitable for diversification especially from what may be a bubble.